Spring is the perfect time to dive into some fun projects to boost your curb appeal and make your home even more beautiful than ever before. Everybody knows that first impressions are incredibly important, but that saying applies to your home too. And the first impression of your home is the way it looks from the outside or the curb appeal. Everything about the front of your home, from the grass to the gutters to the hardware on the front door, works together to create this curb appeal. Spring is the perfect time to dive into some fun projects to boost your curb appeal and make your home even more beautiful than ever before. Lawn care is a massive factor in curb appeal – if your front lawn is unkempt or dying the rest of the house won’t look good. Perform routine maintenance like mowing, weeding, and watering to keep the grass green and beautiful. Add to the greenery with new plants and flowers to up your curb appeal. 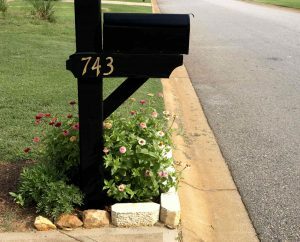 If you don’t have enough time to add a flower bed to your front yard, opt for flower boxes instead and achieve a similar impact. One simple way to enhance the curb appeal is to paint your door so that it draws the eye instead of blending in with the rest of the house’s exterior. This easy project is also relatively inexpensive, and it has a huge impact. The front door isn’t the only door that needs attention. Your garage door will be expensive to replace but super easy to refresh clean it really thoroughly and then stain it or paint it a new color that matches or goes with the new color of your front door. While you’re working on these doors, you should also consider upgrading the hardware on them to something newer that matches the new color. Symmetry is automatically pleasing to the eye, so whenever possible, be symmetrical. Put the same wall light on both sides of the door or plant the same bush on both sides of the steps. A new mailbox is a simple update that can make a world of difference. This may be a super quick and easy task or a bit more complicated depending on the type of mailbox you have. Let go of the old dingy, outdated mailbox and opt for something beautiful that stands out against your house. Cleaning is a simple thing, but it will boost your curb appeal dramatically. Rent a power washer to clean your siding, porch, and driveway. While you’re at it, clean out the gutters so that there isn’t stuff sticking up out of them. This entry was posted on Friday, March 29th, 2019 at 1:25 pm. Both comments and pings are currently closed.